I'm nothing if not a paradox! No rant this issue, I thought I'd let you have a little 'behind the scenes' look at what goes on in my commercial life. This will also enable me to give you the one thing that most of you email or PM (private message) me about... 'how it was done' articles! Ok, on wards and upwards. 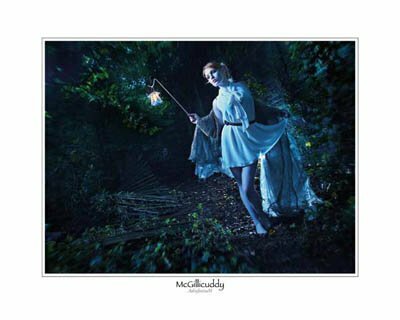 Over the years Team McGillicuddy have worked really hard to maintain their position, high in our ivory tower - it's a position we never take for granted, or are glib about, and is certainly a position we greatly and sincerely appreciate. The truth is though, being so high up in our 'tower of ego' often pays big dividends. One of the recurring dividends is that when manufacturers in our industry look down from their even taller towers, we are often amongst the first to be caught in their line of sight! As such we are asked to do a lot of work for the industry - smashing! So in an attempt to fill the two intentions of: a) giving you an insight into my 'oh so glamourous (not) commercial life' and plenty of 'how it was done' information I'll take you on a quick tour through one of our recent commercial jobs for one of the industry's leading camera manufacturers... there's nothing I like more than when a 'top secret' package arrives at the door! As usual the equipment arrived and the brief was the recurring 'show us what you can do with it', I do like a simple brief that give me lots of room to play! However, I'm here to do a comprehensive job and to give the equipment a genuine work out and hopefully push it out of the comfort zone. With this in mind I always try to do a thorough job and to me that means testing the camera both in the studio and out on location...so here we go! Now from this article's point of view this isn't an equipment review, in fact at this point we will just call the camera, 'camera X' and we will use the testing data to create the 'how it was done' pieces I know you love; that way, hopefully, you'll enjoy the article more and get more positive information out of it than my describing what button 'A' does! 1 x Nissin Di866 fitted to a McGillicuddy 19"
So what did I do and why did I do it? This image was meant to really push the boundaries and see what camera 'X' was really capable of. The image was shot in a location I was familiar with and had used before, so the intention of the capture was clear, even before I arrived on site. I believe that starting with a clear intention, even if it's not what you ultimately end up with, is a prerequisite to the smooth running of a shoot! The study was created at about 7.30 pm so the light was just starting to fade. Add in the location's tree cover and I knew that to achieve the effect I was after would require me to 'drag the shutter' or 'pop and burn' as our American friends call it...so a good test of the camera's ability to use 2nd, or rear curtain, flash sync.